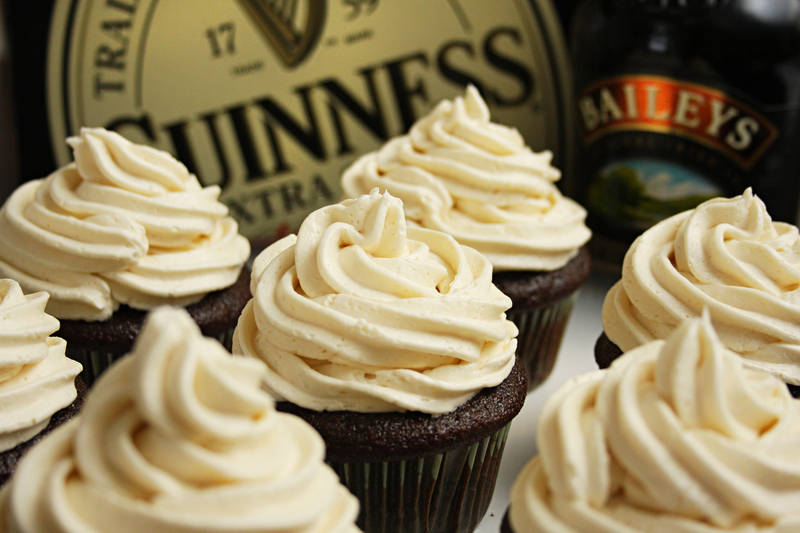 How exactly do "Irish Car Bomb Cupcakes" fit into a "green" challenge you ask? Because whenever I think of Irish, or St. Patrick's Day, I think of the color GREEN. Lucky for me, this challenge isn't strict on its interpretation, so many of the recipes I'm taking on in March have either Guinness or Bailey's in them. Yummm. Now, before someone gets all up in arms over the name of the cupcake like they did on Brown Eyed Baker (where I found the recipe), this is named after the DRINK. This is not a political statement. This is not me being rude or inconsiderate. This is called the "Irish Car Bomb Cupcake" because it uses the same alcoholic ingredients that the very popular drink does. End of story. H'okay. Moving onto the recipe! If you want a truly decadent, moist cupcake with frosting that is head over heels insanely good, you NEED to try these for yourself. Preheat oven to 350F Degrees and line your cupcake pans with your liners of choice. Set aside. SIFT together flour, sugar, baking soda, and salt in a separate bowl. In a medium sauce pan bring butter and Guinness to a simmer. While bringing butter and Guinness to a simmer, in an electric mixer, beat eggs and sour cream on MEDIUM until combined. Add in cooled butter and Guinness mixture on MEDIUM and beat just long enough to combine. Shouldn't take more than a minute or so. Reduce mixer speed to LOW and gradually add in your dry ingredients. Using a wooden spoon (or rubber spatula) fold the batter to combine fully. Spoon cupcake batter into cupcake trays. Each cupcake liner should be 3/4 full. Bake at 350F degrees for 17-19 minutes. 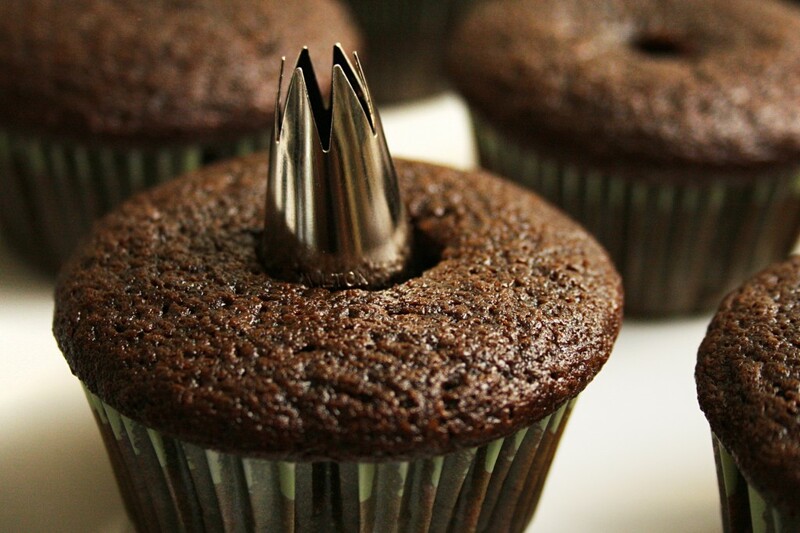 Test your cupcakes at 17 minutes by sticking a knife into the center of the biggest cupcake. If it comes out clean, it's done. Finely chop bittersweet chocolate & put it in a large mixing bowl. In a small sauce pan bring cream to a simmer, then pour it over the chopped chocolate. After about a minute, using a wooden spoon or a rubber spatula (Can you tell I don't have a rubber spatula?? ), gently stir until mixture is smooth. Add whiskey and butter to the mixture and stir to combine. 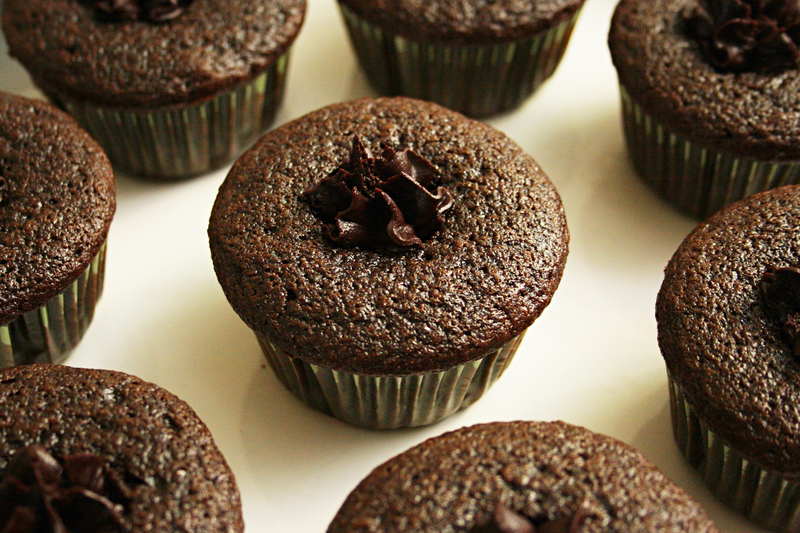 Ganache is ready for piping when cooled, but still warm enough to be easily piped into the center of your cupcakes. Using a large piping tip, and a piping bag, fill the centers of the cupcakes. Gradually add powdered sugar while continuing to beat the mixture on MEDIUM-LOW until butter and sugar are incorporated together. Using a piping bag and your favorite tip (or you can just use whatever you want), frost the cupcakes. To get a large tower of frosting, pipe on one layer to cover the entire top of the cupcake, then add a second layer building it up like it's soft serve ice cream. specifically for these cupcakes. It comes with different size piping tips, a professional piping bag, several disposables, food coloring, and more!